The words in this spoon are a prayer, a request to spark a stronger connection with the Divine, to open the mind and heart, fill your body and your creative work with healing. It ends with an expression of willingness to allow Spirit to be the guide. 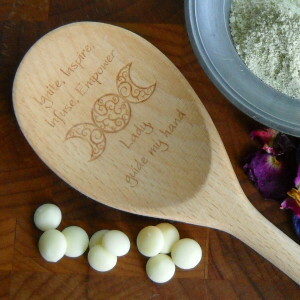 The symbol on the spoon represents three phases of the moon, the waxing (growing), full and waning (diminishing) aspects of the cycle. The Moon is often seen as a symbol of goddess energy as it effects rhythms on the planet (tides) and feminine cycles (sometimes called moon time ). It also symbolizes three stages of a woman’s life Maiden, Mother, Crone. Together, these are a request for a deeper personal connection with the Divine Feminine aspect that holds sway in the kitchen.